TenancyPod - Love TenancyPod? Tell Your Friends! Thank you for your business throughout 2018! Love TenancyPod? Tell Your Friends! Refer your friends to earn free references. If you have friends who are landlords who could benefit from our services, we would love to thank you for using and recommending us. Your good opinion is not only valued by us but helpful to others! 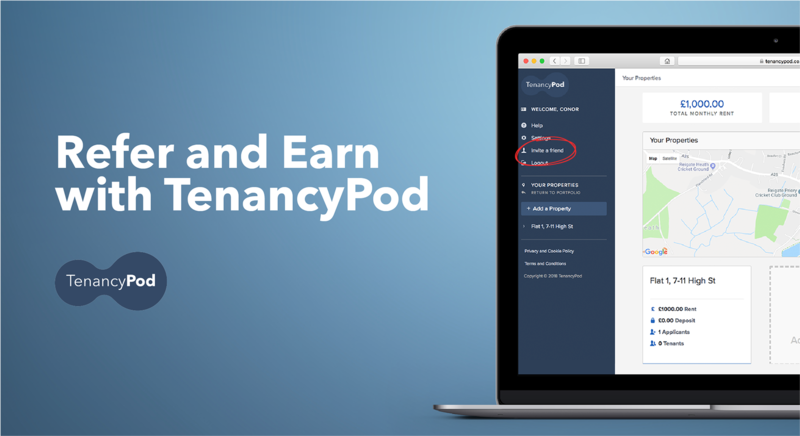 For every 5 landlords recommended by you who order with us, we will allocate you with a free reference to use whenever your next property becomes available. So that we know who you have recommended, simply invite them to register using our invite button on your account. Register for free today, give us a call, or chat with one of our team! Please note calls are recorded for training and monitoring purposes. TenancyPod is a trading name of Rent4sure Ltd. Rent4sure Ltd is an appointed representative of ITC Compliance Ltd which is authorised and regulated by the Financial Conduct Authority (their registration number is 313486) and which is permitted to advise on and arrange general insurance contracts. Rent4sure Ltd's VAT number is 977702577.